Is using a Thudguard being “over protective”? Quite the opposite! Research has shown that "over protective parents" tend to dread and avoid the "learning to walk" phase as much as possible. By their own admission, "over protective parents" claim that they have literally kept their babies in a bubble and may have involuntarily hindered their children as a result of their paranoia, causing them to become late developers in an attempt to evade the pain of their child falling over. Source: ILA independent questionnaire survey/Yahoo/Health/Parenting Health Centre. Until you have a toddler of your own, other people's stories about how traumatic it was chasing their little wobblers around sound just a tad hysterical. I mean really, how hard can it be to keep up with a tiny person whom any grown-up can outrun in a race? It's when you become the warden of a toddler yourself that you realise speed isn't the issue; it's the length of the race and the unpredictability of the terrain. Head Injury Advice - What happens if my toddler does have a head injury? When should my infant wear a Thudguard? Are there any techniques to assist my baby with when “learning to walk”? What is Thudguard made of? What is the difference between Thudguard and a cycle helmet? Isn’t pain a learning curve and bumping your head part of growing up? How did we manage before Thudguard came along? Will Thudguard encourage me to let my baby take more risks? What safety standards does Thudguard meet? How do I fit the Thudguard properly so it won’t cover my baby’s eyes? My child won’t wear hats. How can I get him to wear a Thudguard? Is my child getting too big for a Thudguard? Can I use my Thudguard for my next baby? Do infants fall over a lot? Is my baby’s soft spot (fontanelle), really that vulnerable? How is Thudguard different from other infant safety hats? If the chin strap is stretchy, can my child remove the hat? Is Thudguard suitable for special needs? What do customers say about Thudguard? Need help with your Big Idea or Innovation? This stretchy, comfortable design is suitable for the ages between 7 months to just over 2 years, depending on the size of the child's head, stretching from 40 to 50 centimetres or 16 to 20 inches in circumference. It is recommended to take a measurement of your child's head first to confirm the compatibility of the Thudguard sizing. Thudguard is one of the lightest head guards in the world, weighing just less than 100 grams / 3.2 oz. 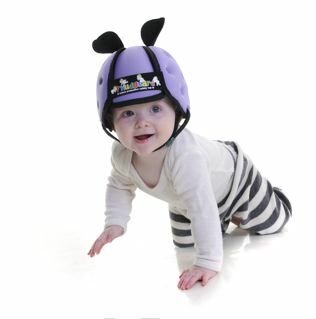 This ultra lightweight design is extremely important for an infant's developing neck muscles. Thudguard helps cushion the forehead, side and back of the head. It is made from ultra lightweight High Density Foam and medium weight, soft-spun poly / lycra. This makes it ideal for stretching and keeping the shape of the helmet allowing it to be very durable and easily kept clean. Holly Willoughby could have done with a Thudguard for her daughter! On my personal behalf, I want to lend full support to this effort to prevent and mitigate head injury in babies and small children. Former President of the European Society for Emergency Medicine. Former Editor of the European Journal of Emergency Medicine.